(August 4, 2002) -- In a domestic violence situation, LBPD says a 16-year old girl may have been kidnapped from her downtown LB residence by her 29-year old boyfriend. Police are treating the situation as a kidnapping pending contact with the victim. Police received a 911 call on August 3 at approximately 11:50 p.m. regarding the kidnapping of the victim from a residence in the 1000 block of Alamitos Ave. where police say she, her family and the suspect had been living together for several months. LBPD says the 16-year old victim, a Cambodian girl, is the girlfriend of the suspect whom they identify as 29-year old Kimsean Tach. Police say the victim and suspect had an argument that escalated into violence with the suspect allegedly punching the victim several times in the face causing serious visible injuries. Police say when the victim's sister tried to stop the violence, the suspect allegedly punched her in the face too. The suspect allegedly dragged the victim from her apartment by her hair and told her family he would have them all killed if they notified the police. The suspect possibly fled in a green Toyota Camry, police say. 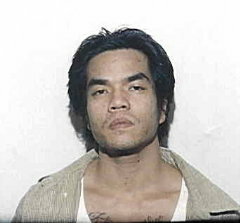 Police say suspect Tach is a Cambodian male with a goatee type beard [suspect photo is obviously without the beard], brown braided hair and brown eyes, 5' 7" tall, 170 pounds, earrings in both ears, numerous tattoos on his arms and chest, and was last seen wearing a white tank top and blue and white shorts. LBPD asks anyone with information about these events to call Detectives Richard Birdsall or Scott Lasch at (562) 570-7244.